the HAES® files: Workplace Wellness—What can we do? I and others writing for this blog have pointed out some significant problems with our current approach to workplace wellness. Employers have indicated in recent polls that they intend to increase their use of coercive incentives and penalties in workplace wellness programs/initiatives. As of January 1, the Affordable Care Act gives U.S. employers who offer health care benefits the right to penalize employees who don’t comply with workplace wellness requirements by having them pay up to 30% more than their compliant peers. Advocate for abolition of incentives. Create models/templates for alternative workplace wellness programs that do not problematize weight or weight-related criteria. Develop ways to measure success other than weight loss. Develop strategies for convincing corporate management of the value of such alternative programs. I thought I’d elaborate a bit about each of these here. One of the most destructive aspects of the current workplace wellness environment is the ubiquitous belief that financial or material incentives are an effective way of motivating long-term health behavior changes. Employers rely on evidence that incentives persuade people to comply with wellness programs in the short term, but fail to take into account that external rewards are ineffective long term and sometimes even have a dis-incentivizing effect in the long term. 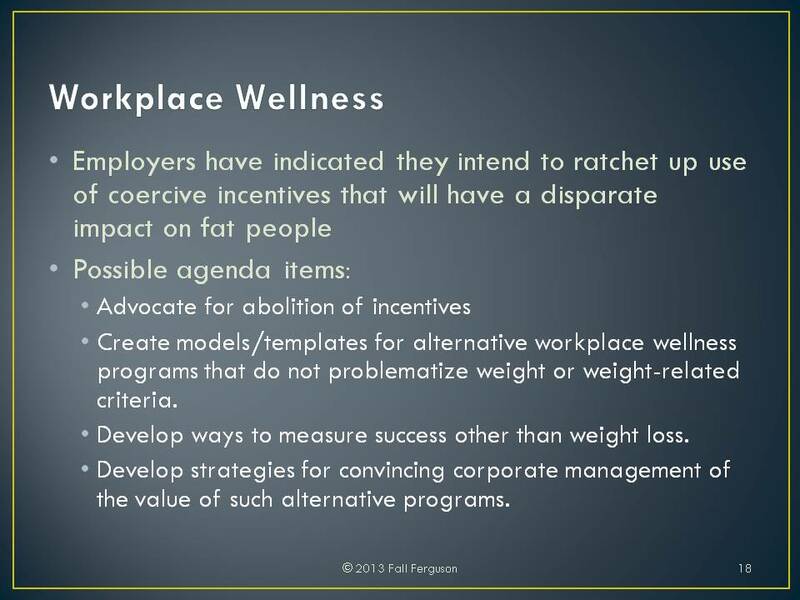 This is an argument that actually goes far beyond a HAES perspective and calls for a complete overhaul of how we conceive of workplace wellness programs as a whole, including our legal/policy framework around them. I can’t explain why health promotion professionals persist in designing programs using material incentives, despite the clear evidence against them, except to speculate on the self-reinforcing nature of certain health ideologies (for another example, consider the entire weight-based paradigm…). It may be more productive to appeal to the employers directly here. My educated guess is that employers are less susceptible to ideology and will be more responsive to evidence about what actually works. So, we need evidence that alternative workplace wellness approaches– ones that don’t use incentives – will lead to better results. That kind of evidence won’t be forthcoming on a large scale until we have more employers building better workplace wellness programs. Some enlightened employers are already doing so, recognizing that problems such as absenteeism, presenteeism, and health care costs are best addressed by building programs that (1) give employees intrinsic reasons for pursuing health rather than bribing them and (2) support “whole person health” rather than focusing on conventional health metrics such as BMI or cholesterol that account only for physiological health in one particular way. As educator and workplace wellness program designer Jon Robison has convincingly argued, employers should be focusing on getting employees “engaged” rather than incentivized. We also need to create models and templates for alternative workplace wellness programs that do not problematize weight or use weight-related criteria. This involves more than simply being “silent” about weight in the program design or not using obviously weight-based criteria to measure success. It’s important to create a wellness environment that welcomes employees of any health status and any size. The legal framework for employer-provided health benefits in the United States (ERISA & HIPAA) generally prohibits employers from discriminating on the basis of health status in the provision of health insurance benefits. As described in my post last month, the law carves out a gaping exception for workplace wellness programs. However, just because it’s legal to discriminate does not mean it is right or advisable to do so. We should be dialoguing with employers to convince them that this type of discrimination—while it may be legal—puts a wedge between employer and employee and actually creates stigma, division, and ill will among their employees. There is no such thing as “perfect health”—and no such thing as a “perfectly healthy” employee. It’s important to help employers understand that using a one-dimensional definition of health will not bring long-term benefit to anyone, employees and employers alike. Employers should be promoting health-positive environments that encourage everyone toward what brings joy, connection, and meaning into their lives at work and at home. How different that sounds from an environment created by bribes, penalties, and discrimination. ASDAH is currently planning a set of guidelines for employers on workplace wellness programs; we would love to hear from readers with ideas for what should be included (or not) in those guidelines. Meanwhile, we are collecting employees’ stories about what’s happening at their workplaces in our Sizing Up Workplace Wellness project. Another important piece of the puzzle is to provide employers with non-weight-based ways to measure the effectiveness of a workplace wellness intervention. Non-weight-based measures already exist for other contexts: can we creatively adapt them for employers to use with their employees? Perhaps new measures are needed; it would be great to have that work done by members of the HAES community. As a start, ASDAH is exploring the creation of a “pre/post” assessment tool for employers to use in their workplace wellness programs. Targeted specifically toward the workplace setting and designed to be given before (“pre”) and after (“post”) a particular intervention, such a test would hopefully show employers how low-tech, high-accessibility, non-healthist interventions improve the health and well-being of their employees. Again, we would love to hear from readers of this blog if they have ideas about how to develop this pre/post test. I listed the importance of convincing employers as a separate point in my conference slide, but the reality is that most of the “convincing” will lie in our successes. We (HAES-minded health professionals) need to get involved with workplace wellness, and write up the programs we design and implement. We need to demonstrate the effectiveness of what we do by conducting evaluations. We must look for ways to bring employers’ attention to the damage being done by discriminatory and weight-based workplace interventions. We need to offer them viable and effective alternatives. Eventually, they will think better of spending money on programs that may shift costs in the short term but fail to provide a lasting benefit to either employees or employers.